Mark Twain was once supposed to have remarked that being good at pool was “the sign of a misspent youth”. I pointed that out across the table to Jamie Vardy as his yellow ball dropped perfectly into the middle pocket – an impressive opening pot. He arched his brow as he cued over his next shot and said, “let’s see just how misspent”, before firing the next ball into the bottom corner. It was an unfortunate in-off that derailed Vardy, however, after a terse comment about my reliance on a bit of safety play. Nevertheless, ball in hand, the game swung in my direction. Another foul and – after a brief discussion about whether a two-shot penalty carries over to the black ball – I was able to sink the 8-ball in the middle pocket to leave the England striker with one of his balls left on the table. “You can have both shots on the black but I will beat you on the re-rack,” had been the way Vardy had settled the rules inquiry – but it was an honour which I instead passed to Daniel Taylor of the Guardian, who promptly showed the misspending of his own youth is presumably beyond question. 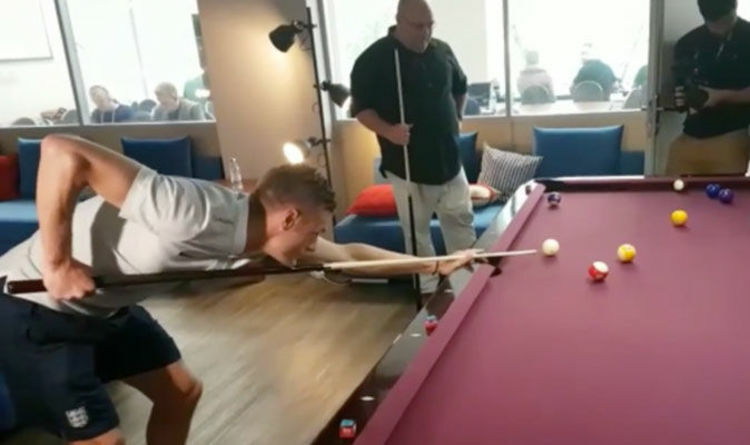 The smooth cueing action and compact stance, chin a whisker away from the cue, showed that Vardy was no stranger to the game although his lack of acquaintance with the table possibly cost him a long pot which rattled in the jaws and could have changed his fortunes. But it had not been a good day for one of the more gregarious characters in the England camp. Put up by the FA for the official media three-dart challenge he lost to Carrie Brown of BeIN Sports. The standard of pool may not have been up to much, but the final score in the darts was a rather embarrassing 22-21. Still, it is the taking part that counts and on a day that there was some unease about how the leaking of a second England team at this World Cup would go down, it is credit to the players and the FA that the spirit is so robust.